● Is the Anzac story a MYTH? ● Who was the LAST ANZAC? ● What is Anzac Day ABOUT? ● Paying too much attention to GALLIPOLI? ● Is Anzac Day now Australia's alternative RELIGION? ● Simpson: Should he have been awarded the Victoria Cross? Did the Anzacs land in the wrong place? Were the British to blame for the failed landing? Were the Anzacs natural athletic soldiers? Did Simpson save lives with his donkey? Did the "drip rifle" enable a safe evacuation to take place? Transcript of an ABC Lateline program. "Much of what we commemorate on Anzac Day is a journalist's construct." Christopher Bantick argues that much of what you read and have been taught about the Anzacs is a myth. Author Peter FitzSimons says the Australian identity arose out of Gallipoli, but researcher Caroline Holbrook says Australia bevcame a nation at Federation in 1901. From On Line Opinion, "Australia's e-journal of social and political debate". Examines the issues raised in What's Wrong with Anzac (see above two items) and concludes: "... regardless of the importance of Australian wartime stories, we should take seriously claims by Marilyn Lake and others of a “militarisation” of Australian history." Newspaper article and review of several books by Paul Ham: The Australian, 24 April 2010. "I chose the books under review on the occasion of the 95th anniversary of Gallipoli because they tell us things we may not -- or prefer not to -- know about Australians at war." 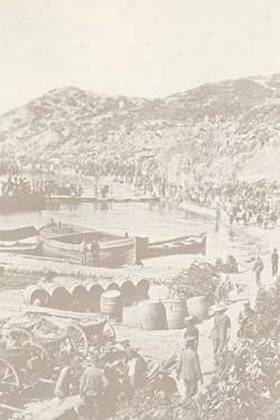 Review of a book by Jenny Macleod in which she compares the British and Australian views of Gallipoli - 'the myth of Gallipoli in Britain, and the legend of Anzac in Australia'. Also titled Dr Peter Stanley speaks about Gallipoli myths. ● See also Negative side of the legend (next section, below). - Evolving History (ABC's The Drum Unleashed, 23 April 2010). Also see the following related item. The Age, 24 April 2009. "Australia's identity shouldn't be built on deaths in foreign fields." Also see the above related item, "Beyond the Legend of Anzac"). ● See also Is the Anzac story a myth (previous section, above). History teacher Peter Jones writes about pacifists' opposition to war in general, and their strong support for the development of international bodies to settle disputes between countries instead of going to war. He also points out that the Gallipoli story would not be recalled with pride by Australians if it had involved the even worse horrors of trench warfare that other soldiers suffered on the Western Front. Approximately 30 articles on Anzac Day and the Anzac tradition written by academics but designed to be read by the generalpopulation. A second report on the Anzac centenary says that multicultural people were not consulted for the first report. A report has warned the Federal Government that celebrating the Anzac Day centenary could provoke opposition from people of some cultures and divide multicultural Australia. This editorial from the Herald-Sun, on the prospect of Anzac Day centenary celebrations being divisive, argues that the tradition of Anzac is to unify Australians, not divide them. To what extent does the Anzac legend of today ignore or over-emphasise multiculturalism and a diverse Australia? 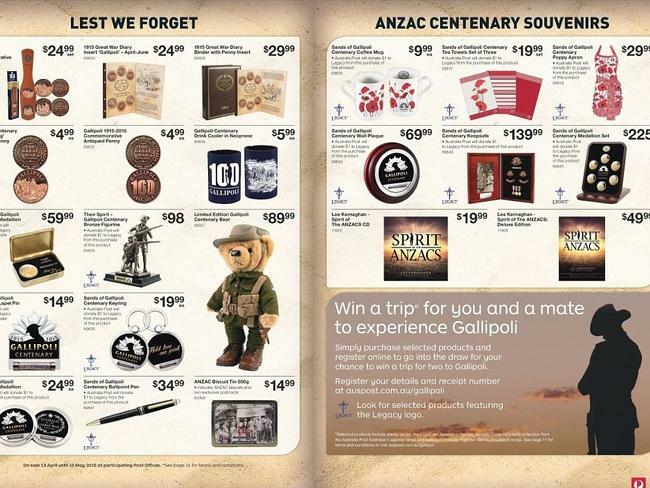 Some retailers now stock up on Anzac-themed products in the same way they do for Easter and Christmas. - story includes an embedded link to video of a relevant 7.30 (ABC) segment (which includes a sexualised T-shirt image). 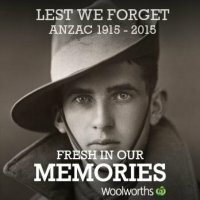 Supermarket chain Woolworths, which promotes itself as "The fresh food people", has abruptly removed an online picture generator that placed the words "Fresh in our memories", the Woolworths logo and the word "Anzac" on uploaded images of soldiers (and anyone else). Minister for Veterans' Affairs Michael Ronaldson says the 'Anzac' campaign by Woolworths was inappropriate. Retail chain Target has been required to remove from sale an "Anzac spirit" drink can holder, a beanie and a child's hoodie from its product range because these items "inappropriately" used the word "Anzac". 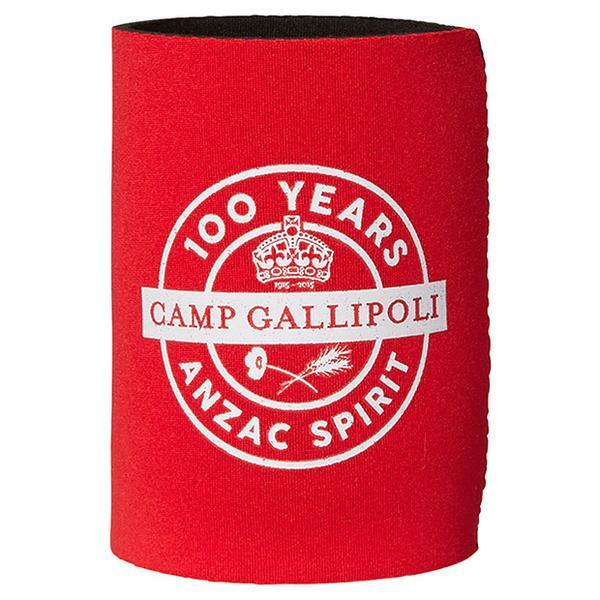 Even Australia Post has been marketing Gallipoli-themed souvenirs. 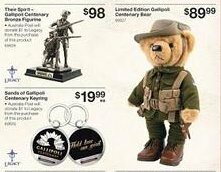 The Anzac tradition appears to have been embraced by many businesses as a marketing opportunity, using the theme to sell teddy bears, sweatshirts, rosemary-scented candles, beer and other products. The body of the text includes many links to examples of commercialisation of the Anzac tradition, including a link to a beer promotion. It is followed by an extensive collection of reader comments. ● See also Applications to use the word 'Anzac' (gallipoli.gov.au). ● See also our Anzac Biscuits issues section. The blanket and commercialised coverage of Anzac centenary commemorations appears to be creating a negative reaction in many people, yet we are seeing record numbers attending Anzac events. Australians are facing 'Anzac fatigue', and the heavy pilgrimages to Gallipoli could contribute to a deterioration of the very landscape Australians revere. One historian likens the recent commemorations to a 'military Halloween'. The focus on the story of the defeat at Gallipoli comes at the expense of recognising the achievements by Australians at the Western Front. A VC for Simpson? Should Simpson be awarded the Victoria Cross? The politicisation of, and changing focus on and support for Anzac Day. The changing focus of Anzac Day has allowed it to become our unofficial national day, writes Bruce Grant. A Behind the News report on the issue of young people participating in Anzac Day marches. Contains video, transcript, activities sheet (Original Word document at http://www.abc.net.au/btn/resources/teacher/weekly/20100316-anzackids.doc apparently unavailable but try this one) . Points out where Anzac Day is explicitly covered in the Australian Curriculum. Agreeing to politicians' calls for greater emphasis on teaching the Anzac tradition will lead to reduced freedom for students to question the historical record and its interpretation, and therefore to reduced engagement with their history lessons, an academic argues. Australian schools are teaching fewer lessons about the country's involvement in past wars, teachers warn. The article points out that a writing effort of Sir Keith Murdoch's contained errors and worse. See the box which lists seven soldiers. Alec Campbell is generally regarded as the "last Anzac". But that depends on how you define "last Anzac". Anzac Day is an appropriate time to discuss war with children. A Behind the News handout on discussions with children on war and violence in the news make a number of useful points. A succinct Behind the News (BTN) document to assist teachers and parents in discussing war and conflict with children. Although the four links at the end of the document are now out of date, this is a very useful document. Lists and examines 32 aspects of discussing war and violence with children. The wartime roles and contributions of women have not been recognised on all Anzac Days. Academic paper presented to a sociology conference. Analyses the representation of women in Anzac Day commemorations. Jonathan Green expresses his views on the intriguing gap between the trumpeted values of the modern Anzac Day and the down-to-earth values of the Gallipoli diggers themselves. Our feeling for the actual suffering of those diggers is fading in comparison to the convenient uses being made of the commemoration of their day. The mental illness suffered by many World War 1 veterans was ignored and even denied by the authorities. Professor Alistair Thomson has written about his grandfather, Hector Thomson, who was a soldier in the Light Horse during World War 1. In the second edition of his book, Anzac Memories, Professor Thomson expands the discussion of the mental illness suffered by his grandfather. Queensland schools are being told they may play the New Zealand national anthem as part of their Anzac Day ceremonies. Premier Anna Bligh is asking Queensland principals to play God Defend New Zealand at Anzac Day ceremonies. Schools can choose to sing the anthem as well. Was dropping God Save the Queen from Melbourne's Anzac Day dawn service disrespectful to Australia's wartime past? New Zealanders and Australians have different approaches in acknowledging Anzac Day. Anzac Day apears to have grown beyond a tradition and a legend to become an alternative secular religion in Australia. ● Is it Anzac or ANZAC?